If you find yourself looking to remove rust, a quick glance is to see multiple commercial products to pick from. The issue is that while these products will remove rust from metal, they are toxic to some extent and their key ingredient is either oxalic or phosphoric acid. If you do use one of these strong commercial cleaners, you will need to carefully follow the instructions as well as warnings and wear rubber gloves. Doing so will remove the rust while protecting you from toxic chemicals. Luckily, you don't have to rely on these harsh products with toxic chemicals. You can learn how to remove rust with common household items which are completely safe to use. Perhaps the most common issue is how to remove rust from metal; there are a few effective options. If you are using white vinegar to remove the rust, begin by soaking the item in some white vinegar for several hours before scrubbing the rust off. If you can't fit the object in a container filled with white vinegar, pour a layer of vinegar on top of it or wipe it with a vinegar-soaked rag. If necessary, use aluminum foil (dipped in the vinegar) to scrub the rust like a brush. It should be minimally abrasive but still work. You can also use standard vinegar, but let the object soak a full day. Another option is to use lime and salt. Sprinkle some salt over the rust and then squeeze lime juice over it. Let this mixture set two or three hours. Use the lime rind for scrubbing off the mixture as this is a great method of how to remove dust without damaging metal. A final option is to create a paste by combining baking soda and water. Spread the mixture on the metal and let it sit before scrubbing it off. Scrub off the baking soda paste with a toothbrush and rinse it clean. It tends to be fairly easy to remove rust from washable fabrics as long as you have the proper supplies on hand. If you get rust on a washable fabric (polyester, olefin, nylon, acrylic fabric, etc. ), first put lemon juice on the stain. Before the lemon juice dries, rinse it off with water thoroughly. If you can't wash the fabric after applying lemon juice, instead use a rust remover that is safe for fabric. After using the rust remover, flush the area by using cool water and wash it as soon as you can. When you need to know how to remove rust from non-washable fabrics, the ideal option is to take the fabric to a professional so they can clean it effectively without harming the fabric. If you choose not to take the fabric to a professional cleaner, then take lemon juice and combine it with salt, creating a thick mixture. Test the lemon juice and salt mixture in a small area of the fabric. If there is no negative reaction, put the lemon juice and salt mixture on the rust stain and put the fabric in the sun. Keep moistening the stain with more lemon juice until you can no longer see the stain. Brush off the residual salt. Start by rubbing the stainless steel rust stain with a piece of emery paper (very fine grade) which is damp. Now rub the stain with an onion slice. Rinse the stainless steel thoroughly using hot water. Dry the stainless steel using a soft cloth. If the rust stain is on a toilet, ceramic tile, sink, or tub, begin by wetting the pumice bar. Then rub the damp pumice bar on the stain. (Don't use this method for ceramic glass, ceramic cooktops or cookware because it will cause surface scratches). Try making a paste from lemon juice and borax. Rub the borax and lemon juice paste on the rust stain, letting it dry. 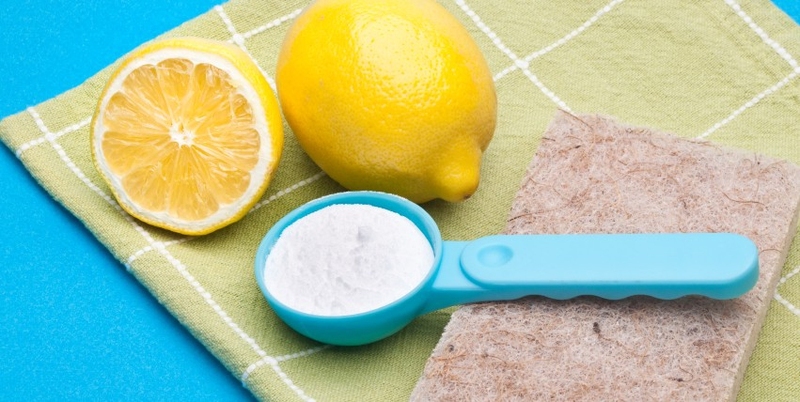 Rinse off the borax and lemon juice paste using water, repeating the process if needed. Dry the surface by using the clean cloth. Remember that for the best chance of removing rust, you should deal with the rust stain as quickly as possible. Anytime you are using a new cleaning solution to remove the rust, first test it on a small and inconspicuous area of the fabric or surface. This allows you to check for damage and avoid ruining an entire item of clothing, countertop, pan, or other item. Anytime you finish using a cleaning solution, rinse it out thoroughly before moving on to the next one. If you do not thoroughly remove the cleaning solution, it may interact with the chemicals in the next solution you try, creating a poor reaction and damaging the item you are attempting to clean. Never rub fabric harshly when trying to figure out how to remove rust stains. If you rub the fabric too vigorously, it may begin to fade or abrade fibers. When using any commercial detergent or stain remover, be sure to read the product label thoroughly. This will allow you to understand how to properly use the product as well as any safety precautions you need to be aware of.